a macroscopic cordlike structure of the body, comprising a collection of nerve fibers that convey impulses between a part of the central nervous system and some other body region. See Appendix 2-6 and see color plates. Depending on their function, nerves are known as sensory, motor, or mixed. Sensory nerves, sometimes called afferent nerves, carry information from the outside world, such as sensations of heat, cold, and pain, to the brain and spinal cord. Motor nerves, or efferent nerves, transmit impulses from the brain and spinal cord to the muscles. Mixed nerves are composed of both motor and sensory fibers, and transmit messages in both directions at once. Together, the nerves make up the peripheral nervous system, as distinguished from the central nervous system (brain and spinal cord). There are 12 pairs of cranial nerves, which carry messages to and from the brain. Spinal nerves arise from the spinal cord and pass out between the vertebrae; there are 31 pairs, 8 cervical, 12 thoracic, 5 lumbar, 5 sacral, and 1 coccygeal. The various nerve fibers and cells that make up the autonomic nervous system innervate the glands, heart, blood vessels, and involuntary muscles of the internal organs. Details of structure of components of nerve tissue. accelerator n's the cardiac sympathetic nerves, which, when stimulated, accelerate the action of the heart. acoustic nerve vestibulocochlear nerve; see anatomic Table of Nerves in the Appendices. afferent nerve any nerve that transmits impulses from the periphery toward the central nervous system, such as a sensory nerve. See also neuron. articular nerve any mixed peripheral nerve that supplies a joint and its associated structures. auditory nerve vestibulocochlear nerve; see anatomic Table of Nerves in the Appendices. autonomic nerve any nerve of the autonomic nervous system; called also visceral nerve. cranial n's see cranial nerves. cutaneous nerve any mixed peripheral nerve that supplies a region of the skin. See anatomic Table of Nerves in the Appendices. 1. a nerve that lessens the activity of an organ. 2. an afferent nerve whose stimulation causes a fall in blood pressure. efferent nerve any nerve that carries impulses from the central nervous system toward the periphery, such as a motor nerve. See also neuron. excitor nerve one that transmits impulses resulting in an increase in functional activity. excitoreflex nerve a visceral nerve that produces reflex action. fusimotor n's those that innervate the intrafusal fibers of the muscle spindle. 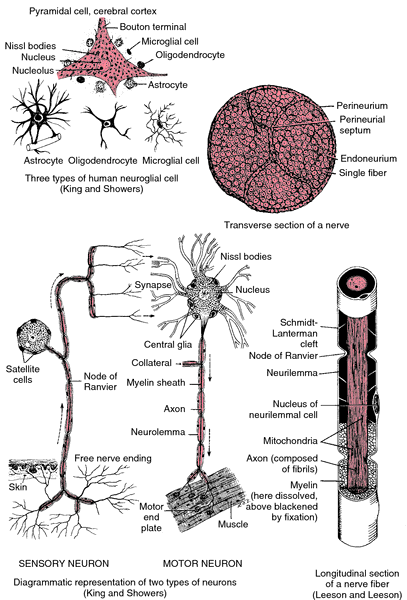 gangliated nerve any nerve of the sympathetic nervous system. inhibitory nerve one that transmits impulses resulting in a decrease in functional activity. mixed nerve (nerve of mixed fibers) a nerve composed of both sensory (afferent) and motor (efferent) fibers. motor nerve a peripheral efferent nerve that stimulates muscle contraction. myelinated nerve one whose axons are encased in a myelin sheath; called also medullated nerve. peripheral nerve any nerve outside the central nervous system. pilomotor n's those that supply the arrector muscles of hair. pressor nerve an afferent nerve whose irritation stimulates a vasomotor center and increases intravascular tension. sciatic nerve see sciatic nerve. secretory nerve an efferent nerve whose stimulation increases vascular activity. sensory nerve a peripheral nerve that conducts impulses from a sense organ to the spinal cord or brain. See also neuron. somatic n's the sensory and motor nerves supplying skeletal muscle and somatic tissues. spinal n's the 31 pairs of nerves arising from the spinal cord and passing out through the vertebrae; there are eight cervical, twelve thoracic, five lumbar, five sacral, and one coccygeal. , and see anatomic Table of Nerves in the Appendices. 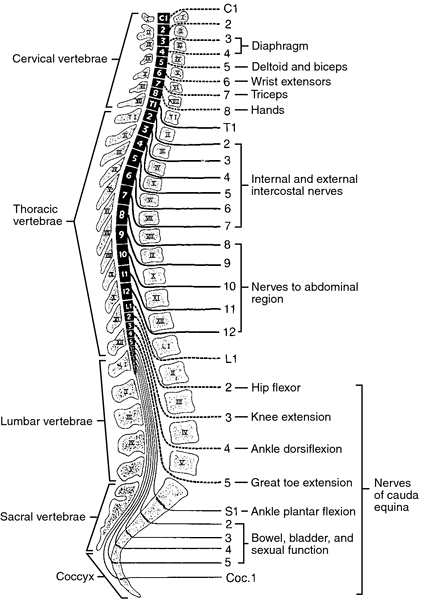 Spinal nerves emerging from the spinal cord through the intervertebral foramina with muscles or muscle movements listed for specific levels. From McQuillan et al., 2002.
splanchnic n's those of the blood vessels and viscera, especially the visceral branches of the thoracic, abdominal (lumbar), and pelvic parts of the sympathetic trunks. See Appendix 3-5.
sudomotor n's those that innervate the sweat glands. 2. any nerve of the sympathetic nervous system. trophic nerve one concerned with regulation of nutrition. unmyelinated nerve one whose axons are not encased in a myelin sheath. vasoconstrictor nerve one whose stimulation causes contraction of blood vessels. vasodilator nerve one whose stimulation causes dilation of blood vessels. vasomotor nerve one concerned in controlling the caliber of vessels, whether as a vasoconstrictor or vasodilator. vasosensory nerve any nerve supplying sensory fibers to the vessels. a nerve composed mostly or entirely of efferent (motor) nerve fibers conveying impulses that excites muscular contraction; motor nerves in the autonomic nervous system also elicit secretions from glandular epithelia. an efferent nerve that conveys impulses to motor endplates or another terminal and is mainly responsible for stimulating muscles and glands. An efferent nerve conveying an impulse that excites muscular contraction; motor nerves in the autonomic nervous system also elicit secretions from glandular epithelia. Motor or efferent nerve cells carry impulses from the brain to muscle or organ tissue. general term for any nerve consisting of efferent nerve fibres en route to effectors (muscles, glands). Nerve composed mostly or entirely of efferent (motor) nerve fibers conveying impulses that excite muscular contraction; those in autonomic nervous system also elicit secretions from glandular epithelia.